On Call, Vol. 3, No. 1 - From the Hospital Security Camera Department: The Photography of St. Elsewhere "The Amazing Gunters"
Go back and watch re-runs of most TV shows produced prior to 1982 and you'll notice something missing...camera movement. It was the great irony of television, a medium designed to replace radio with "moving images", became reliant on and complacent with generally static images edited together, or scenes switched live using a series of static cameras. To a large extent, St. Elsewhere helped to change all of that, and pave the way for the now expected, continuous handheld shot sequences, such as we see on ER. The story of how this change evolved is due in no small part to one particular family. 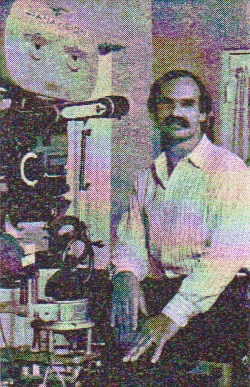 Rick Gunter served as the camera operator on St. Elsewhere from the very beginning, and continued in one capacity or another throughout the entire run of the series. 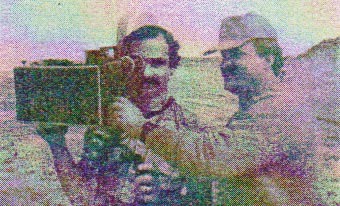 At first he worked under Director of Photography, John McPherson. McPherson brought years of experience to the set, and worked well with the young Rick. NORMAN LLOYD ... "John always had a wonderful sense of lighting, and, above all, a great sense of camera placement. He's a master at making use of modern equipment. He shoots marvelous close-ups too." But after serving as DP on a dozen episodes, McPherson used his Christmas vacation from St. Elsewhere to take a job shooting a mini series, and the vacation became permanent. RICK GUNTER ... "I think basically there was a miscommunication between John and his agent. We left during Christmas break to do a pilot, and I believe John's agent told Bruce (Paltrow) that John didn't want to come back to St. Elsewhere. My father Marvin filled in as DP for about four days prior to HIS vacation, and (after that) Bruce said, 'What the heck, we'll just keep Marvin.' I was operating for John at the time on the pilot for V when they decided not to bring John back and hire my father instead. I left the pilot early because they wanted me back on St. Elsewhere." 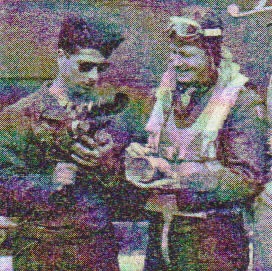 Marvin Gunter got his start in camera work in 1942 when, after having been inducted into the Army, he attended a Photography School at Lowry Field in Denver. His subsequent assignment was to photograph World War II. Marvin's big break in television came in 1959 when he was hired as camera operator on the Steve McQueen western series Wanted Dead or Alive. From that point on he worked steadily in television. Including stints on Dr. Kildare, High Chapparal, The Courtship of Eddie's Father, The Magician, and, (just prior to St. Elsewhere) on Eight Is Enough. Along the way, he and wife Betty raised two children, Judy and Rick, the latter of which decided to follow in his father's footsteps. RICK GUNTER ... "I started as a still photographer when I was 16. I did weddings and bar mitzvahs, National Geographic pictures..."
MARVIN GUNTER ... "I always encouraged both of my kids to do whatever they would have fun doing. When you have fun at your job, you will always excel. Rick showed an interest in photography in high school. He also took still photos as a sideline through college. After college I asked Rick to join me for a few days on Planet of the Apes (the TV series) in 1974. A few days turned out to be a career." And it's a good thing for TV fans that Rick didn't return to the store because, eventually, he and his Dad would collaborate on our all time favorite medical drama. MARK TINKER ... "The first thing they brought (to the show) was an amazingly even temper that was loaded up with good humor. We'd tell them what we wanted, and they would always be game for trying all sorts of new stuff. In addition, and important in trying to make a schedule, they were fast as lightning. They were really quick in lighting setups, and really flexible in trying to get there, allowing us maximum opportunity for movement and range in terms of degrees of a shot. And you know what, you very rarely got the feeling that it was father and son. It was always two guys on a camera crew together." And what a crew they made. 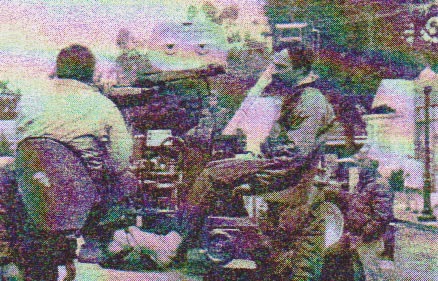 Marvin continued as DP through the end of the fifth season, then retired, handing over the reins to Rick. 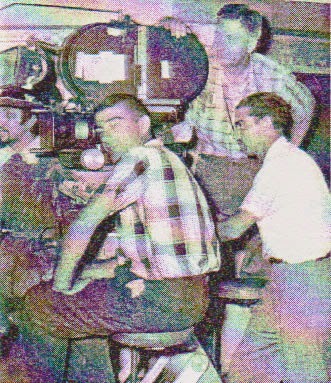 (Steve Randolph moved up to Camera Operator under Rick.) But throughout the run of the show, it was Rick's style that most defined the look of St. Elsewhere. MARK TINKER ... "As Bruce always used to say, Rick has a gyroscope in his stomach. He was the most amazing hand held operator I've ever worked with. Steady as a rock, could walk all over the place, go upstairs, downstairs, squat, crouch, and then whip pan over to something and just nail it. And he would do it basically the first time. And strong...man that guy was strong. Forearms like Popeye, and lats like steel, wrapped in leather. People thought we were either on a dolly or a steadicam. I can't say enough about Rick's participation in terms of his operating. His contribution was more than considerable. BILL DANIELS ... "The Producers took every opportunity to have a moving camera, and once you start with either the handheld, or long trips down hallways, you really have to have a very good cameraman. Rick was very good at that, particularly with somebody like Mark Tinker directing, who loved to speed down those hallways. Rick was very calming, very cool and collected, and he had a lot of different directors that he had to deal with that came in for the first time (because Bruce believed in giving people that kind of opportunity) and I remember when I directed my episode ("The Children's Hour") - he was very easy to work with." ON CALL ... Did Rick anticipate what you wanted? ELLEN BRY MASIUS ... "Rick was awesome, he's just incredible. He was low key and a calming influence. Nothing really rattled him in all the years we worked together. I never saw him have a tens or angry moment, or a fight with anyone, and you know there are a lot of egos to satisfy." ON CALL ... Why was Rick's attitude so important to you as an actress? ELLEN BRY MASIUS ... "Because his calming influence helps you to relax, and if you're relaxed, you're more open to what's going on around you. You can act better when you're relaxed. Rick is a fabulous cameraman, and after the first season of working with him, everyone knew that we were working with the best." Rick, Steve Randolph shooting "Afterlife"
SAGAN LEWIS ... "The beauty of Rick was that he was not only talented, he was grounding force on the set. Just being around him you felt good, and safe, and comfortable. He had a lot of integrity." STEPHEN FURST ... "Rick was so innovative and terrific. I was such a novice back then, and now that I've learned how to direct and know the cameras. I think of all the equipment that is used now in television that (guys like Rick) didn't have 10-15 years ago, and they made it look easy. They'd get in a wheelchair and run down the hall with a camera on their back." But that's not all. Rick is also known for his expert planning and time management efficiency. RICK GUNTER ... "I anticipated what people need. I read the script, I help the Director because I try to keep myself informed. I know what we're going to do, so that during the rehearsal, I'll light it in my head. So does my gaffer, and we talk, and immediately the guys are working... the rehearsals take less time, and it takes me less time to light because I'm already halfway there." And that approach to setups stood Rick in good stead as he moved on after St. Elsewhere to work on Dallas, and then (and now) as DP for Aaron Spelling. RICK GUNTER ... "I thrive on pressure, and I never feel it. What I do is look at the day's work, and I know where I want to take more time, and what's going to go fast. So I budget myself - personally - I say 'OK I'm going to take more time here and here, then we'll zip through this (over here)' and it works every time. When I did Dallas, we started at eight day shows, and when I left Dallas, it was a six day show. I did Love Boat, The Next Generation - it was seven days per show. When I left, they went to a five and one half day show. But while Rick and Marvin have set standards of excellence and efficiency for generations of operators and DPs to come, their real legacy might be that they applied their trade as a family while working together on St. Elsewhere. During the first five seasons, Paltrow employed all four Gunters, all at once. Marvin was DP, Rick was Camera Operator, Judy as a stand-in, and Betty was an extra (whom you often saw at the nurses station). MARVIN GUNTER ... "Having all of them working with me was a wonderful experience. All of them, Judy, Betty and Rick were professionals in their own right, so it made things easier for me. They also brought to St. Elsewhere a feeling of a family atmosphere. The working conditions were the best that I have ever experienced in the forty years in the business." BONNIE DANIELS ... "They were all terrific and did their job well, and had a great deal of dignity." Dignity? Not according to Stephen Furst, who was victimized by one of the Gunters. Today, everyone's paychecks are intact. John McPherson is a successful director and is at the helm of Seven Days for the WB (in which Norman Lloyd appears), and Rick is one of Aaron Spelling's MVPs - having worked on Beverly Hills 90210, Melrose Place, Love Boat: The Next Wave, and, now, Charmed. And despite a distinguished career and some impressive credits to his name, you won't catch Rick bragging about his work. ON CALL was persistent, however, and he did submit to one final query. ON CALL ... What is it that you and your Dad will be remembered for when it comes to the years on St. Elsewhere? RICK GUNTER ... "We had that documentary style that nobody else had developed like Bruce, Mark, my father, myself. Use of the handheld camera like nobody else has every used it. And I don't think anyone will use it like that again." No argument from us. Then again, who's going to argue with a man who has a gyro inside his stomach?